Stir together the butter, olive oil, chives and some salt and pepper in a small bowl. Place a potato between the handles of 2 wooden spoons or 2 chopsticks. 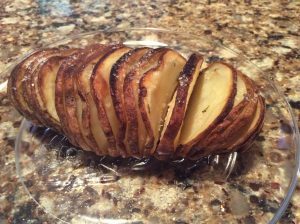 Slice the potato into thin slices, leaving 1/4 inch at the bottom unsliced; the spoon handles will prevent you from slicing the potato all the way through. Repeat with the remaining potatoes. Put the potatoes on a baking sheet and brush on the butter mixture, making sure to get in between all the slices. Bake until tender and crisp, 55 to 60 minutes.